Explore some of the best beaches in Florida on your family trip to one of these unique destinations. Choose from small secluded islands, lakes, quiet FL beach towns and city getaways with great state parks just steps from famous museums, attractions and restaurants. Play in the water, relax in the sun, build sandcastles and have fun with your kids on these stunning Florida beaches on your Florida weekend getaway. You may also like: Orlando, Gulf Coast and Miami beaches. A trip across the Rickenbacker Causeway across the beautiful Biscayne Bay is an adventure in itself, but after a short drive from the hustle and bustle of Miami, you will find yourself in true Florida in a tiny island town between two wonderful parks – Bill Baggs Cape Florida State Park and Crandon Park. Palm tree-lined streets, quaint shops, galleries, restaurants, and, of course, some of the best beaches in Florida make Key Biscayne a lovely escape destination. Go for a swim or rent a kayak at Bill Baggs Park, visit the historic Cape Florida Lighthouse, go swim with dolphins at the Miami Seaquarium, play golf at the renowned Crandon Golf Course, or watch turtle eggs hatch at the two-mile long Crandon Park beach. 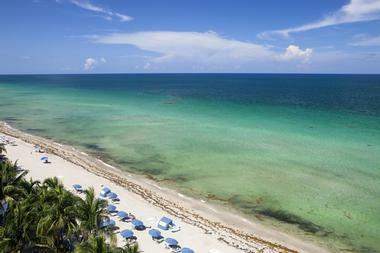 If you are looking for top beaches in Florida, Key Biscayne is a great place to visit. 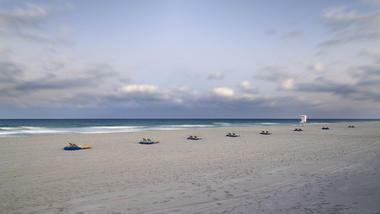 Sarasota’s Siesta Key beach is one of the best Florida beaches. Glimmering white and made of pure quartz crystal, this piece of paradise is hugged by waters of the Gulf Coast. 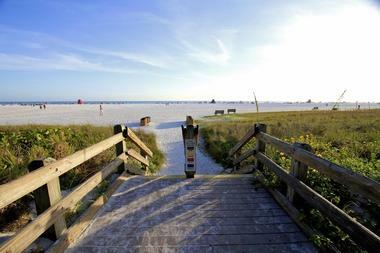 And that is just one of several Sarasota beaches to choose from. 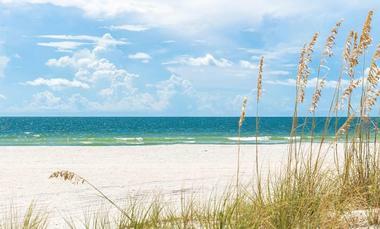 You might find it hard to leave your hammock or lounge chair on the beach in this lively Florida Gulf Coast town south of Tampa, but the kids might demand some action. Mexico Beach is one of the best Florida beach towns where time has stopped. Just 20 minutes from Panama City Beach, you will find no fancy resorts or enormous condo buildings blocking the spectacular view of the ocean. Just miles and miles of fine sand, emerald waters and quaint seaside restaurants and shops where you can go barefoot like everyone else. 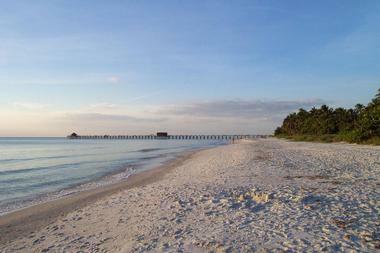 Mexico Beach is home to some of the most beautiful beaches in Florida. It is the perfect place to try scuba diving, go for a boat ride, watch thousands of birds or try to catch some fish. There is also a spectacular sunset every day, so find a comfortable chair with a colorful drink in your hand and wait for the famous green flash. If you are looking for nice beaches in Florida for families, this is a great vacation spot. 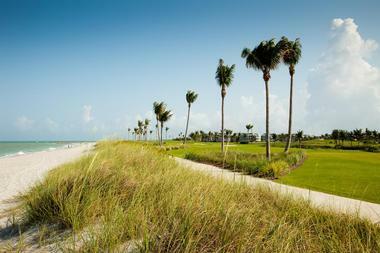 Best known for its fantastic golf and high end shopping, Naples, located in southwest Florida on the Gulf of Mexico, is a perfect family vacation destination. The city has miles of powder-fine golden sand beaches and many wonderful parks where kids can spend hours building sand castles, swimming, or playing ball. 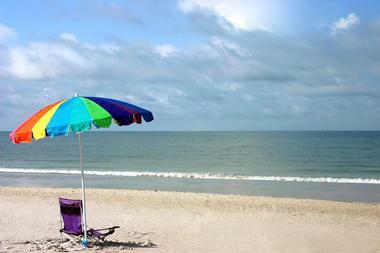 This area is home to some of the best Florida beaches. Cedar Keys consist of enchanting little islands about three miles off the Florida coast about 100 miles north of Tampa and fifty miles southwest of Gainesville. Laid back and charming, many of them are uninhabited and make for a fabulous kayak destination where you can spend a day on the deserted beach. The biggest town is Cedar Key located on Way Key. It is a place artists discovered and have taken over, and you should consider visiting in April when 120 artists come for the annual festival. The Cedar Keys were declared a bird and wildlife sanctuary in 1929, and the park there is named the Cedar Key National Wildlife Refuge. You can see rare white pelicans, majestic bald eagles, and vibrantly pink roseate spoonbills, along with many other birds that make the islands their home. The islands are a beach lover’s paradise, and it is difficult to decide which of the beaches you will discover is the most beautiful. Beachcombing, hiking, fishing, boating, or canoeing are among the favorite activities. You can also do nothing but sit on the beach with your camera and wait for that perfect shot. 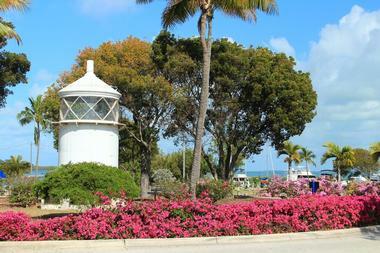 For a change in scenery, visit Clearwater Marine Aquarium, fun Fort De Soto Park, or South Florida Museum and Bishop Planetarium, take them fishing at the Skyway Fishing Pier park, and if you manage, convince them to visit world-famous Salvador Dali Museum and spectacular glass creations by Chihuly on Beach Drive. For food, the best place is the enormous 20,000 square foot Locale Market, a true foodie heaven. 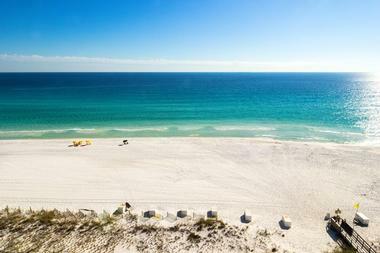 Located on the Emerald Coast in northwest Florida in the Gulf of Mexico, Destin is home to some of the best white sand beaches in Florida, bright green waters, and fabulous fishing. Waters are so rich in fish that the town is named the "world’s luckiest fishing village." Kids will be delighted with a visit to the Big Kahunas Water and Adventure Park, a snorkeling trip, or a dolphin cruise. Located on sunny Gulf Coast of southwest Florida, Fort Myers is a popular tourist destination for its long golden beaches, fabulous fishing, high-end shopping, and as much action as you can stand. Doing nothing under an umbrella on one of the county's pristine beaches is fine too, if the kids let you. If they do not, take them paddling on Hickey Creek, exploring barrier islands with an Adventures in Paradise boat tour, looking for alligators and panthers in Telegraph Cypress Swamp and Babcock Ranch, or getting to know a different side of Florida at the Edison & Ford Winter Estates. While visiting one of the four islands that make Islamorada in the Florida Keys, it is very likely that you will spend most of your time under, on, or by the water. Fishing is the major pastime for tourists and a source of jobs for locals. 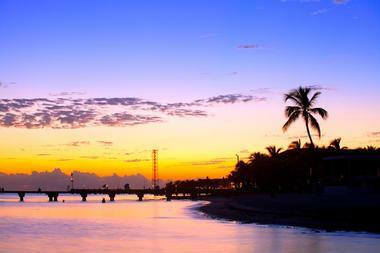 In fact, Islamorada is best known as the "Sportfishing Capital of the World." You can spend time in or on the water by snorkeling, diving, parasailing, kayaking, windsurfing, boat racing, and even feeding an enormous silver tarpon. Ernest Hemingway did it, and so did Zane Grey, so feel free to indulge – you will be in a good company. If you or the family gets tired of action, stretch out on the beach and enjoy a tropical colorful drink while watching another magnificent sunset. Jacksonville is a large, modern city in northeast Florida, a business and cultural center of the region. But, there is another reason to visit Jacksonville: its other, more natural side. The city has 22 miles of fine sandy beaches that are never crowded where you can laze the day away or engage in any of the water activities. 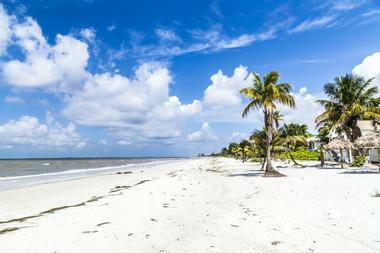 Sanibel Island is a small piece of paradise just a short drive from Fort Myers. 15 miles of the most breathtaking beaches imaginable surround the island, and you can easily spend days not moving away from the water. Visitors might find themselves completely alone on the beach, or other vacationing families might be spending time in the area. You will notice that everyone stoops to the ground every now and then. They are engaged in the most popular island activity, which is collecting shells. They are 250 kinds of shells on the island, and they are so numerous and so beautiful they are difficult to resist. You can also go swimming or fishing, visit a beautiful historic lighthouse, or go for a tropical drink in one of the beach resorts. Beaches are also full of birds – 230 kinds of them – so bring your camera. When you get tired of walking, you can rent a canoe or a bike to make use of the 25 miles of bike paths, or go on a boat tour to see the island from the sea. 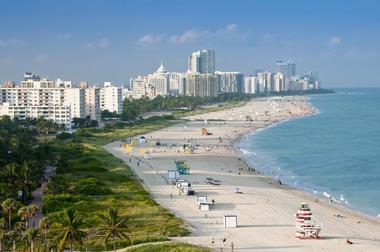 Miami Beach is located on a barrier island between the Atlantic Ocean and the Biscayne Bay. Its oceanfront is lined with wide, fabulous beaches, and Ocean Drive, lined with the popular beach, is the center of the island’s nightlife. Other beaches are smaller, more secluded, and more family-friendly or are part of the nature reserves. They all have one thing in common: they are spectacular. If you are travelling with kids, Zoo Miami with more than 3000 animals is a must-see. Check the Everglades Alligator Farm, Miami Seaquarium, and Jungle Island, take an airboat ride through the Everglades, and, for a bit of education, explore Miami Children's Museum with 14 interactive exhibits. Fort Lauderdale, a popular tourist destination on the Atlantic coast about 23 miles north of Miami, is famous for its spectacular beaches, 165 miles of quaint canals, and 46 cruise ships that set sail from the city. 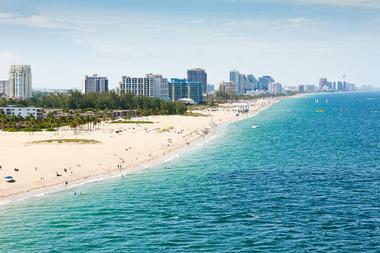 Only about 170, 000 people live in Fort Lauderdale, but more than 12 million visit the city every year. Why? It is a city where you can do as little or as much as you want. More vacation ideas in Florida: 22 Best Things to Do in Tampa. A unique blend of history, breathtaking natural beauty, an ideal climate, cultural diversity, and architecture, Key West managed to enchant and inspire Tennessee Williams, Ernest Hemingway, Elizabeth Bishop, Jimmy Buffett, Robert Frost, and so many others. You are next. The streets are unbelievably charming, with fancy gingerbread mansions on one side and tin-roofed conch houses on the other. Clearwater is what we imagine a beach town in Florida to look like: 2.5 miles of fine sand beaches, picturesque boardwalks, funky beach shacks, a beach festival every single night just because the sun is setting, and, most importantly, numerous ice cream shops all along the beach. 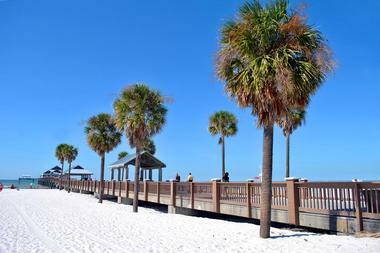 Clearwater Beach is located on a narrow barrier island just across the water from Clearwater, northwest of Tampa. You can rent a cabana or a beach umbrella and spend a day under the sun, walk along the bustling, lively Pier 60 or Clearwater Marina, take the family on a Pirate Cruise, or visit dolphins and other animals at the Clearwater Marine Aquarium, where you can meet Winter, the star of the much loved movie Dolphin Tale. 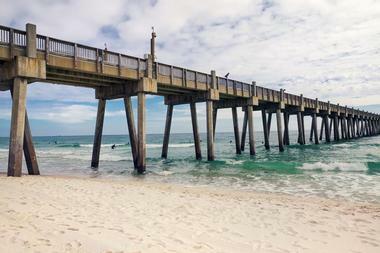 Pensacola Beach will take your breath away. The beaches are a gleaming white, wide, and uncrowded, contrasting sharply with the emerald green waters of the Atlantic. It is located on a barrier island of Santa Rosa just across the water from Pensacola on the mainland. The beauty of the island is mesmerizing, and it is possible to spend hours, or even days, just lying on the sand watching the horizon and feeling all your worries float away. 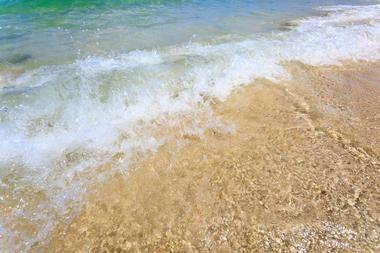 Kids splash in the water, stroll along the sand collecting colorful shells, or search for hatching turtle eggs. A little over an hour’s drive from Jacksonville or Daytona Beach, St. Augustine is America’s oldest town with a very young spirit. Old cobblestoned streets are lined with galleries, restaurants and shops, and the magnificent beach surrounded by timeless dunes that is a mecca for sun-worshippers – the city has attractions for any age or interest. If you are trying to keep the kids happy, start your explorations at the Alligator Farm, where you can get close to the beasts or watch them from the zip-line high above the trees. Check out the Pirate Museum, where Treasure Hunt is a sure hit with the kids. The Castillo de San Marcos is like a trip to the past with soldiers dressed in period costumes and original cannons booming from time to time. 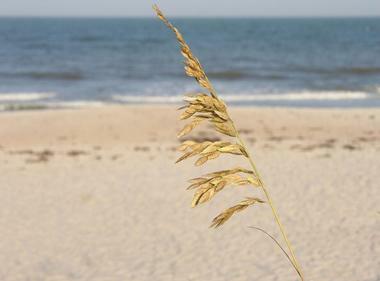 If you are looking for active Florida beach vacations, there is so much to do and see in St. Augustine, you will just have to come back. Pounded by the fierce waves of the Atlantic Ocean and divided between Palm Beach and Marine counties, Jupiter Island is a spectacularly beautiful narrow barrier island with rich and diverse plant and animal life and miles of fine sand beaches. There is so much to do for nature lovers, so you should enjoy the beautiful beach parks before the kids discover all the action. After taking in Dubois Park with 1,200 feet of tropical paradise lined by tall palm trees, Ocean Park with its picnic pavilions and playgrounds, or any other beautiful seaside park, let the kids climb the Jupiter Lighthouse or play a round of nautical mini golf at the Lighthouse Cove, or you can take them paddling a canoe along the Loxahatchee river, among the ancient stands of Bald Cypress. A tiny, seven-mile long island off Florida's West Coast, Anna Maria Island is world-famous for its spectacular sunsets, and it is known for being a hideaway for many celebrities. It is also famous for its laid-back lifestyle typical of Florida, magnificent beaches, and nature trails that will take you all around the island on foot, on bike, on rollerblades, or on one of the free trolleys. Excellent golf courses are there for passionate golfers. There are also great snorkeling, fishing and scuba diving, bird watching on the dunes, and dining opportunities of all kinds, from the hot grouper sandwich on the pier to a gourmet meal in one of the luxury restaurants. If you decide to do absolutely nothing but lie on the beach in the shade of your umbrella, don’t feel guilty – that is the island’s most popular sport. One of Florida’s Thousand Islands, and the only developed one, Marco Island is located just a short ride from Naples and the Florida Everglades. It is a harmonious combination of luxury resorts, spectacular beaches, and wild, unspoiled parks. Kids can spend days exploring lovely sand beaches and collecting shells, but if they get bored with that, take them to visit Briggs Nature Center with a half-mile long boardwalk where they can watch wild creatures in their real, natural habitats. Alternatively, you might take a boat tour of Ten Thousand Islands to see dolphins, turtles, and manatees. In the evening, stop at Quinn’s on the Beach to watch fire-dancers who entertain tourists every day at sunset. Just an hour north of Miami, Delray Beach is a small beachfront town with unexpected sophistication and one of the prettiest beaches in Florida. The city has lively art life with over 20 galleries, and there are art pieces all over downtown. Famous Pineapple Grove Arts District is home to Artists Alley, where visitors can watch artists working in their studios. Nature has created its own art with spectacular Delray Municipal Beach, where kids can rent snorkeling gear and paddle boards. A visit to the Sandoway House Nature Center where they can see live shark feedings is sure to be a hit with the kids, and so will a stop by the 505 Teen Center with Skateboard Park to play basketball, video games, and billiards. Biking is popular in the city, and there are several places where you can rent bikes or Segway. Another way to explore the trails around the town is on horseback with the Aberdean Riding Academy. The city is famous for its colorful festivals, so check what is going on before booking your trip. Siesta Key is a picturesque barrier island off the southwestern coast of Florida across the bay from mainland Sarasota with eight miles of the finest beaches in the United States. Siesta Beach has been rated the best beach in the country for its fine white quartz sand, and, with shallow waters and a lifeguard year around, it is a perfect kids’ beach. There are also volleyball and tennis courts, a children’s playground in the shade and a nice picnic area, and many convenient concession stands if anyone gets hungry. Crescent Beach is more secluded and rich in marine life and corals, which are great for snorkeling. Turtle Beach has more action and sport facilities, and you can even try fishing at the Blind Pass Lagoon located nearby. If you ever get tired of beaches, check the nearby Siesta Key Village for some great restaurants and live music at night. Hollywood is an enchanting Florida beach town between Miami and Fort Lauderdale famous for its colorful oceanfront promenade. This popular road called the Hollywood Beach Broadwalk is two and a half miles long and brick-paved, and it is always packed with those who want to see and be seen: roller-bladers, joggers, bikers, walkers, and skateboarders. The rest of the world sits in one of the sidewalk cafes or bars watching the scene unfold. Two beach parks on the other side of the road are designed for kids who are not amused by the show on the Broadwalk and prefer to play paddleball or splash in the fun dolphin fountain. 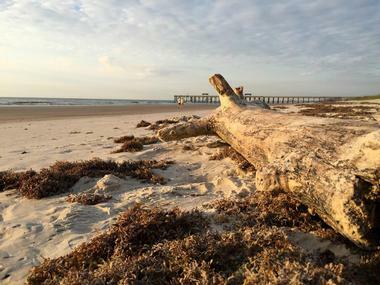 A part of the chain of Atlantic barrier islands near the Georgia border, Amelia Island is one of the oldest tourist destinations for the rich and famous in the country. But, this southern beauty has had a long and turbulent history. Timucua Indians discovered the area thousands of years ago, and six different nations fought over the area. Its biggest town, Fernandina Beach, is a treat to explore with its beautiful Victorian architecture, quaint shops, and fantastic restaurants. The island has 13 miles of spectacular beaches, and most them are protected in one of the numerous parks and nature preserves. Explore the island marshes, beaches, and maritime forests in a kayak or on a bike. Take a boat tour to see the rich marine life such as American Right Whales. You can also hop on a paddleboard or surfboard or stroll through the charming Historic District. 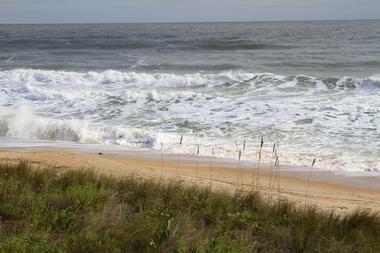 More ideas: Best Things to Do in Flagler Beach, Florida. 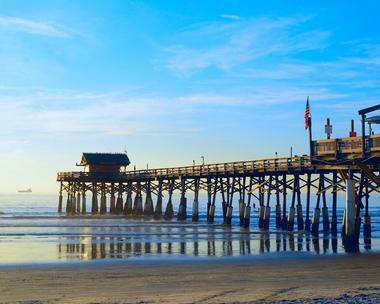 About an hour from Orlando lies Cocoa Beach, a charming seaside town where strange things come together: spaceships, sea turtles, great surfing, fine sandy beaches, and breathtaking sunsets. It is the home of Port Canaveral Cruises, BCC Planetarium, and the Kennedy Space Center. It is also a warm, laid-back coastal town with miles of lovely beaches where endangered turtles lay eggs, where surfers flock to from all over the world, and where kids enjoy splashing around the water. Duran Golf Club is ideal for serious golfers, while Brevard Zoo is great for little and big animal lovers. Come to Cocoa Beach to learn to surf, take a kayak trip to Thousand Islands, watch baby turtles run to the surf, and fish on the iconic Westgate Cocoa Beach Pier.